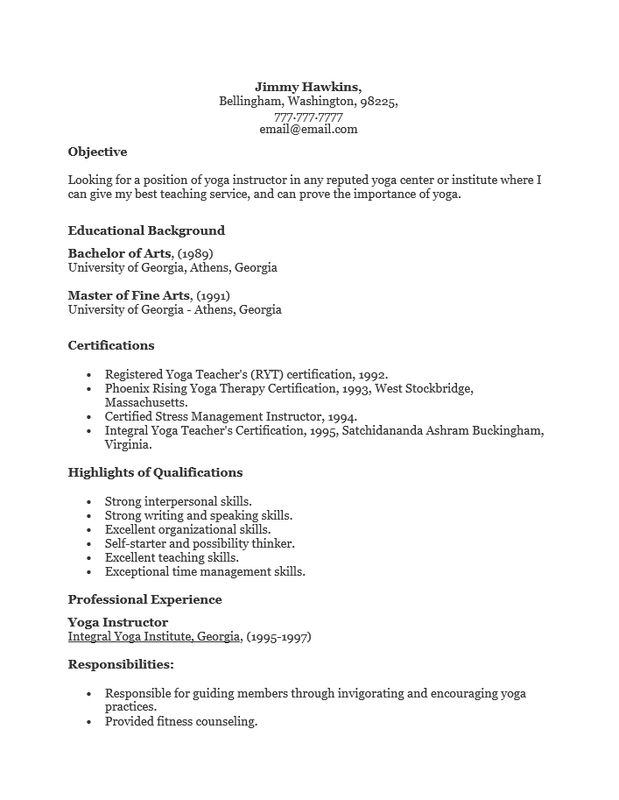 The Yoga Instructor Resume Template is designed for instructors who wish to follow a standard resume format when pursuing a promising opportunity. Templates can be particularly useful when one wishes to concentrate on content and bypass any potential troublesome formatting issues. 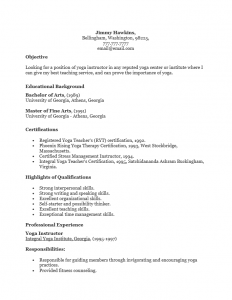 If one has multiple opportunities to respond to relatively quickly, a yoga instructor resume template may be easily revised to focus on a particular position thereby increasing one’s chances of attaining an in-person interview. This is the goal of every resume. In order to make a positive impression on a hiring entity, on should take some measures to create the best possible resume. This would include taking the time to fill out each section, proof reading, and of course making sure all the information is accurate. Job seekers should also try their best to include current resume buzzwords for a polished sound to the document (there are many websites that list them). Job seekers are encouraged to produce a well thought out resume unique to the position being applied to. Step 1. Place your full name at the top of the page. Below this should be your contact information. This is basically your calling card and it would be wise to make your name a bit more noticeable than anything else on the resume. This will make it easier to remember. Step 2. Write a brief statement or two regarding your intention. Include your determination to obtain the position and a reason to hire you based on your experience, skill, or both. This should be placed in the “Objective” Section. Step 3. The section labeled “Educational Background” is a vital section for a yoga instructor since this is a field involving people’s health. This should list any degrees and certificates you earned. This should list the name of the degree or certificate, the name of the institution or facility where you studied, and the year you were awarded the degree/certificate. Step 4. Compose a list of your strengths, skills, and proficiencies. These should be placed in a bullet list under the “Highlights of Qualifications” heading. Treat this section as a place to shine. You should list the positive attributes you possess as an instructor and present them in a polished and complimentary manner as possible. Step 5. The “Professional Experience” is the area where you may list your employment history. This will be a chronological listing of all the places you worked with the most recent at the top of the list and the oldest at the bottom. Each entry should list your job title, where you worked, and the dates you were employed there. Below this should be a list of the duties you performed there and any accomplishments you may wish to showcase.